Why are the quotes I’m getting so expensive? This is the number one question from most people considering solar. Truth of the matter is that the cost of solar panels and the balance of system or BOS parts has dropped significantly over the last two years. Material costs alone have dropped from $6/watt to $1.25-2.00/watt. From a DIY perspective, this means that you can install solar at a material cost of $1250 to $2000 for each 1000 watts of panels. That’s just FOUR 250 watt panels. This very same system will be quoted at installed pricing as high as $3,000 to $5,000. There are TWO primary reasons for these high prices. The first reason is that there are lots of overhead costs that a dealer must cover: office, inventory, insurance, workman’s comp, liability, phones, utilities and staff salaries for Solar designers, installers, electricians, fleet costs and more. Trouble is, a 50% gross margin falls short of covering all these costs, and leaves no room for profit. So, the cost must be hiked up to the point where it allows the business to stay in operation. Some companies have higher costs than others and you may find a RANGE of pricing, all very high. That’s not to say that they are bad… just that they cost more than a DIY installation! I have MANY friends at other companies, and of the guys I know, they all do excellent work! I really want solar, but I can’t afford those prices… What are my options? What about PAYBACK time, REBATES, and GRANTS? 2: You will reduce your electric bill by the amount of power your solar system produces by way of a Net metering agreement with the power company. This reduction in electric bill will continue for the life of the system – at least 25 to 30 years! With the expected RISE in electric rates, your savings will be even greater! 3: For the next 7 years, you can sell the SRECs your system produces (Solar Renewable Energy Credits). SRECs are traded in private markets much like the stock market, and are purchased by companies who are MANDATED to purchase a portion of their energy used from renewable resources like Solar. This is above and BEYOND the energy savings on your electric bill. 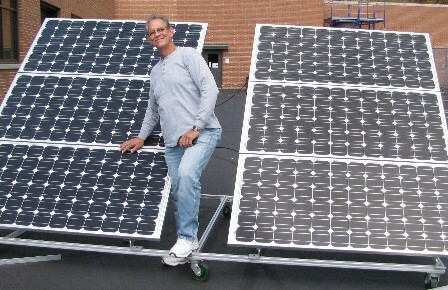 Your system will produce about 1 SREC for each 1000 watts of panels you put on your roof. If you have 3000 watts of solar panels installed, you can sell (Through a broker) 3 to 4 SRECS per year. In the past, they could be sold for as much as $250 each! But increased buildup of solar has forced pricing down to the $40 range for Ohio, $250 for NJ, and in between for other states that offer them. SRECs are planned to be phased out by 2025, so if you want to recoup as much of your system cost as possible as quickly as possible, NOW is the time to plan and install it!! By reducing your electric bill, getting the tax credit, and selling your SRECs, you can cut the PAYBACK PERIOD for your solar installation to as little as 6 to 8 years, even without the grant money. Since your system will perform almost maintenance free for the next 25 to 30 years, your Return On Investment (ROI) can be substantial, and certainly better than the best stocks, bonds or mutual funds that you can find available today for the budget of the every day average worker making 40 to 75K a year. So what’s THE BOTTOM LINE if I do it myself with your help? OK, let’s assume you are an average consumer of electric. Check your electric bill, and on the back should be a summary of the last 12 months of electric power usage. If you’re like most folks, your average monthly electric usage is between 400 an 800 KWH. 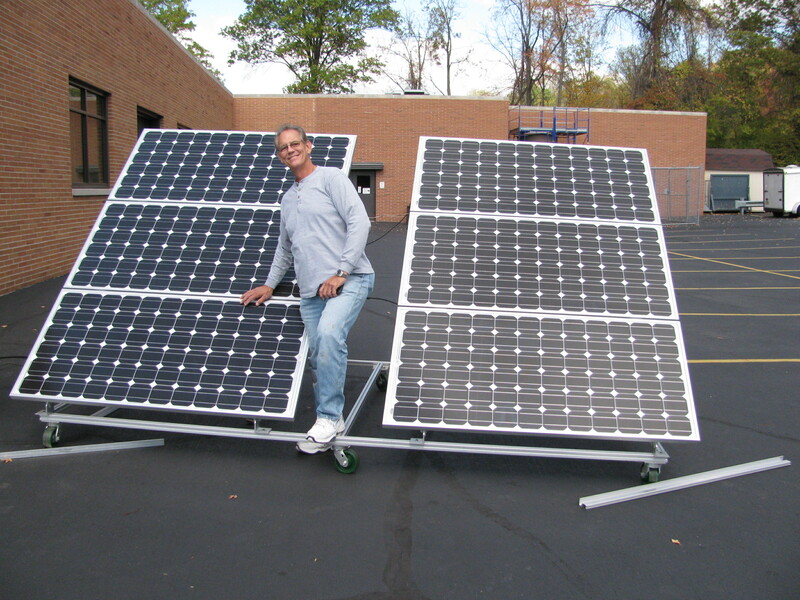 To offset most, or all, of this amount of power, you will need a system made up of 20 to 28 panels. The more you can afford, the more you will save. The “Sweet spot” on the market right now is 245 to 260Watt panels priced between .58 and .85 per watt, by the pallet (20 or 24 panels). They’ve NEVER been more affordable!! Best pricing is only available in PALLET quantity. This is usually 20 to 28 panels. They are always shipped by truck freight, so a pallet is the most economical way to ship. Also, it saves the panel seller from having to BREAK the pallet and then store and track the loose panels. You’ll also need a way to convert the DC voltage from each panel into AC power. The simplest and safest way is to use micro-inverters, one per panel. Each micro-inverter provides 230 watts of 240 Volt AC power. Figure on $150 per micro-inverter plus a little extra for shipping. Next, you need racking to support your panels. There are lots of different systems, and to be safe, there are calculations that will need to be done. The racking parts will run about $500 plus another $200 for truck freight (the rails are 12 to 14 feet long and are shipped by truck freight). Great, I’m interested – so WHAT WILL YOUR SERVICES COST ME? My rates are pretty simple. $375 gets you a primary consult. At this point I’ll consult with you and carefully go over your desires, expectations and goals. I’ll give you an outline of the steps you’ll need to take to be in compliance with local codes and jurisdictions, and how to go about filing for permits with your town, village or city. I’ll answer any questions you may have about pretty much anything that you’re planning. I’ll offer some good TIPS about how you can save even more money by planning ahead and being a wise shopper. I can also help you by passing the hardware through to you at dealer cost! If you are well organized, capable and determined, you can take it from there with the knowledge that you’ve got a SOLID PLAN that won’t break any laws and won’t burn down your house! 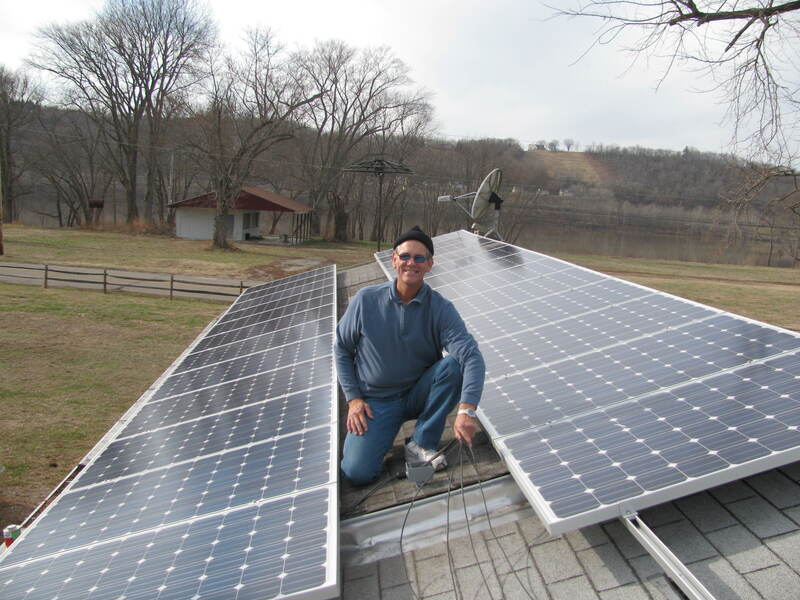 If you’d like more hand holding and help filing all the paperwork with the proper authorities, and some oversight when you’re actually installing the system, I offer a $1500 Full Solar Consulting package. I’ll be available by phone, email and in-person as the need comes up to assure you that you’re making the right purchases, installing the components correctly, and following safe and proper installation requirements. This $1500 fee also applies to major commercial customers looking for a hard quote to do a commercial job. Still quite a bargain compared to the commercial pricing for a system like the one you want, and a small price to pay for peace of mind!! Well, I hope that if you’ve read this far, I’ve managed to hold your attention, and you realize the information I’ve provided is accurate and helpful. 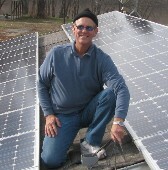 I’m just a one man show, promoting solar and helping folks like you achieve your solar dreams. There are lots of photos and installation details in the BLOG section of this website. I post them as they are completed. Lots of good info there as well! If you click on the photos, they will pop up as big images so you can have a closer look. The 24 panel array is one I helped my buddy Brock install at his Uncle’s shop in New Richmond. 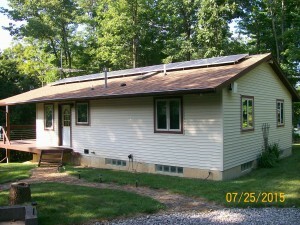 The small house with 13 panels is my weekend place in the South Central Ohio mountains. The 6 panel setup is one I did while taking my 1st solar class at Cinci State! I also installed a 24 panel array on my Newtown house in 2011! With a 5 to 7 year payback this is pretty much a no-brainer, but you still need to come up with the full amount up-front. SRECs were pretty lucrative up till 6 months ago, when the overbuild of solar in Ohio caused the prices to tumble. Remember, you’ve got to wait till tax time NEXT year to get the 30% rebate. I hope that you’ve found these FAQs interesting and educational. If you have a comment, or would just like to talk solar (no charge) visit the contact page and leave your name and phone number. I just love this stuff! I’ve also built a 60 watt panel for camping from one of those kits on Ebay. If you’re considering this, PLEASE contact me, since I can most definitely give you some suggestions about what NOT to do!! This is definitely NOT what you want to do for your 4000 watt grid tied home system! Here’s a cool little solar calculator I found! I wouldn’t trust the numbers, but it will allow you to fit array on a satellite photo of your house!